The next couple of weeks are going to be really busy and exciting as I prepare for a couple of events, both of which are happening on the same day. On top of that, the art show will be taking place on the first day of FITC Toronto where I will also be doing a presentation entitled ‘Back to the Future’ on the morning of April 25th at 10am. My talk will involve some inspirational designs from the past and present, a showcase of my work, a short technical section where I walk through one of my process, some of the online tools I use to get my work out there, and a small advice section for aspiring designers. It will be a great time, I hope you can make it. I’m looking forward to these two Signalnoise events, and have been for the past few months as I made the necessary preparations. 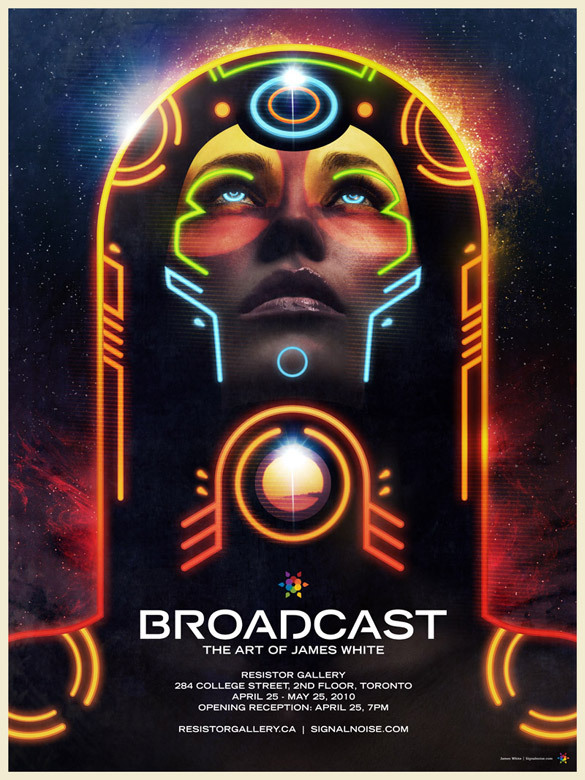 The Broadcast poster above will also be available once I get some posters printed in the next week or so. Looking forward to meeting all those who attend :) See you soon, Toronto! In addition: FITC Toronto is also holding a gallery opening entitled Barricade at Function 13 on April 25th featuring the work of James Paterson, James Braithwaite and Jeremy Felker, 156 Augusta Avenue. Two cool events on the same night, Toronto! Congrats! New work looks great. Yeah it looks great! Reminds me of Egypt. I. Love. This. Eye candy absolute! I’m really liking this. It looks like you went back to your roots somewhat, and reexamined certain techniques. It’s still definitively Signalnoise, but seems to have something fresh mixed in. Could be my imagination, but I like it either way. Man, this is one of those times that I really wish I lived in Canada. Good luck with your talk! Thanks a lot, guys. Really appreciate the encouragement. Matthias, haha. Should have had a contest to see who would be the first to say that. Solemone, good eye. This was totally inspired by Egyptian design, some Tron and a bit of Jack Kirby. Perhaps I should update the post with a few inspirational materials. I won’t be able to make it to FITC this year, but I am going to come check out your gallery. Email me when you are going to be around, and what day is a good day to come chat with you. Sick piece. Trying to rustle up some funds for an excursion to TO to see your gallery show. Keep up the works, I love your style. Very cool James, good luck and have a great time! Poster is awesome! Good luck for the show James, great poster too! You are really an inspirative artist. Makes me think of a fusion between ancient Pharaohs and Tron. Fantastic as always. Very Tron meets 2001 meets Cleopatra. Congratulations and best of luck with the show. This looks top-notch James. Great job! Sick work as always, James. Good luck at FITC and with your art show! Shiiiiiiiiiitttttt, that looks awesome! Have fun at the show, I wish I was close to come check it out. Totally coming to the gallery and grabbing a print to support you. FITC is out of my price range unfortunately. Wow, that’s an amazing poster. Congratulations James! Are you going to be videotaping your lecture? I’d love to see it. Thanks so much for all the kind words and encouragement, everyone. That means a lot. Bryan, I believe the FITC gang will be recording all the talks and making them available on their site. I’ll be sure to post the talk up on the blog once available. did you create your wordpress theme yourself or use o e already created? If you used one already made, which one? And if you made it yourself, how? Awesome work James – Going to try to make sure that I’ve got some time to check out your show here in Toronto. Hi there – fantastic work as always. First post for me as I’ve been a lurker on your site for over a year now…! Enjoying your SN Broadcasts too – Ill look up when you are next online and try to tune in. If you manage to venture to the shores of the UK in the not too distant future I would love to interview you on my artist blog. Hello, my name is Catherine Santivanez. I am a Art Studio major at the College of New Rochelle I would like to ask , how do you feel an artist’s style helps or does not help their development of a work? I am currently writing a research paper based on the philosophy of art and artists. If you could please email me back as soon as possible that would be much appreciated, thank you very much for your time and input.